The Made in NY Media Center by IFP is starting a brand-new short film screening series. For each edition, we pick a short film made by one of our Media Center (MC, for short) members and determine the theme for the full evening's program. The rest of the program will be filled with up to six shorts from filmmakers living in the New York City area. We invite the filmmakers behind these shorts to take part in a Q&A session after the screening. We're kicking off MC FOR SHORTS on a happy note, so the theme for the first edition is FEEL GOOD. Our member David Bizzaro will bring lots of happiness with his selected film, THE PITS. He describes his filmmaking style as, "inventing optimistic stories that make you smile". Expect to leave the evening with joy and fuzzy feelings. 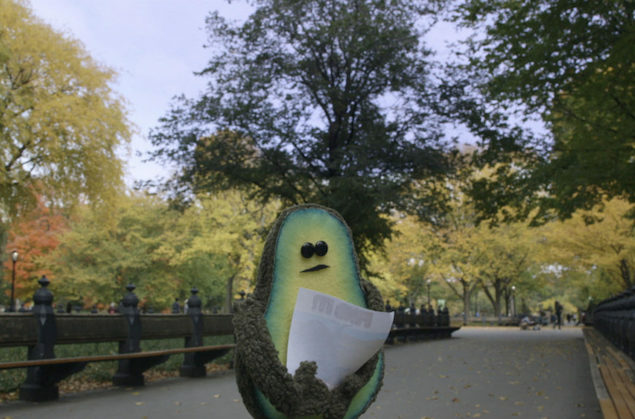 he wrote and co-produced The Pits—a puppet-based award winning short film about an avocado finding its other half. As of today, it has played in 24 film festivals (and counting!) around the world. David is also a freelance builder and puppet wrangler for The Jim Henson Company and Sesame Street. David was just awarded a 2018 Made in NY Fellowship where he will be developing his next puppetry based film over the next year. Academy Award-nominated documentary filmmaker, Christine Choy, undergoes an adventure of wild proportions when she accidentally illegally smuggles cigarettes. Seconds after the wedding, a bride is stunned to learn that her new husband fudged nearly everything about his past, his family, and his accomplishments— but his revelations force her to come clean about a few shocking secrets of her own. Stuck in her dad's boring lunch meeting, little Ella suddenly discovers the curious case of all the mustaches. Submissions are currently closed for the May 23 FEEL GOOD program. Check back with us next month for updates on how to apply for future MC FOR SHORTS programs.